In a press release, the German Supreme Court (BGH, 13.12.2012, I ZR 217/10, MOST-Pralinen) stated that the booking of a generic term (“pralinen”) as a keyword on Google AdWords whilst using the “broad match” function, does not constitute a trademark infringement, when users, entering a query (“Most pralinen”) similar to the trademark of a competitor (“MOST”) as a search term, are shown ads for other companies than the one of the trade mark owner, although (1) the text of the (side-)ad does not explicitly rule out any possible commercial connection between the TM-holder and the competitor and (2) when booking the keyword “pralinen” on Google AdWords the term “MOST Pralinen” was suggested as a “Keyword Idea” by the Google AdWords Keyword Tool. For a detailed summary of this case please see my previous post and an article by Clark/Schubert, Journal of Intellectual Property Law and Practice, 2011, Vol. 9, No. 9, 602. 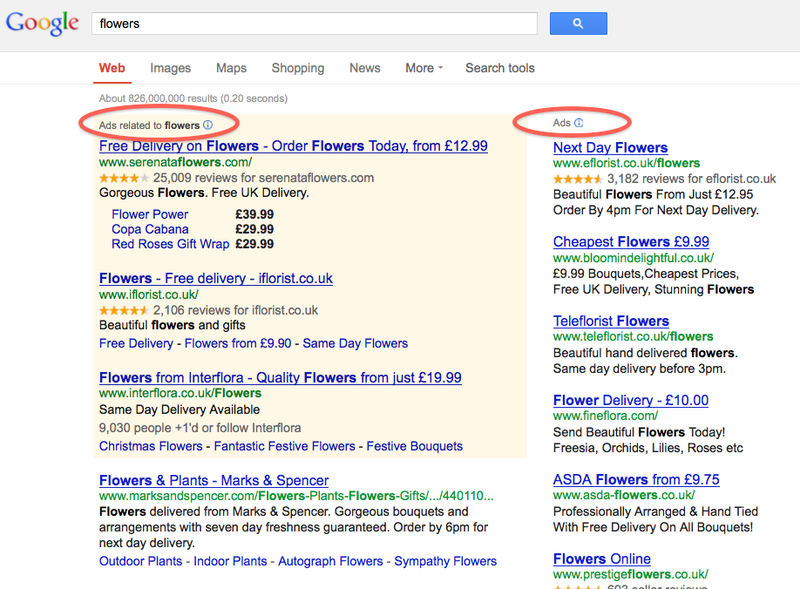 Google Top- and Bottom ads now contain a small text field “Ads related to” followed by the search term entered in bold letters. This change obviously took place at some point during May 2012, so it will not affect ongoing litigation before European courts (UK: Interflora, GER: Most Pralinen) , but it will make it for sure harder for plaintiffs to claim consumer confusion. 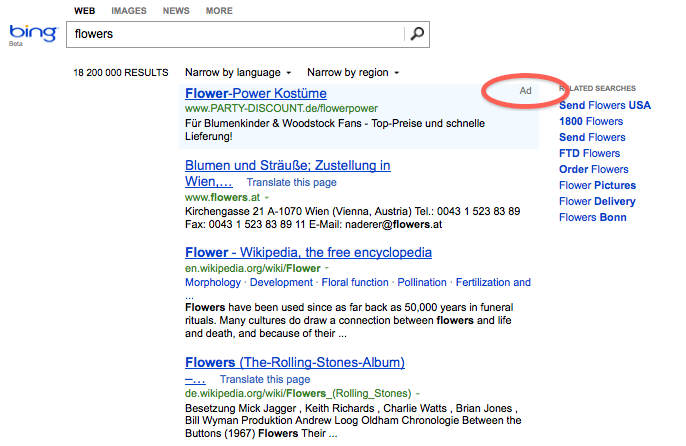 What is interesting to note is that Bing.com has not yet added such a text field. Ott (Links&Law) was so kind to point out a recent study by Franklyn/Hyman on consumer expectations and confusion when using trademarks as search terms. *ECJ Wintersteiger C-523/10: A Forum Shopping (Winter) Wonderland? On February 16th Advocate General Pedro Cruz Villalón has published his opinion on C-523/10 Wintersteiger, a case concerning a jurisdictional matters referred by the Austria Supreme Court [OGH, 5.10.2010 17 OB 8/10s, Wintersteiger]. Just about two month later, on the 19 of April 2012, the ECJ issued its decision on this reference for a preliminary ruling. The court found that Google AdWords TM-disputes “may be brought before either the courts of the Member State in which the trade mark is registered or the courts of the Member State of the place of establishment of the advertiser”. What makes the case so delicate is that Austria (place in which the TM is registered) is, in regard to Keyword Advertising cases, the most right holder friendly court in the EU [OGH, 21.06.2010, 17 Ob 3/10f, BergSpechte III], while Germany (member state of the establishment of the advertiser) is fairly liberal on this matter [BGH, 13.01. 2011, Az. : I ZR 125/07, Eis.de]. We are left to see how this decision will increase legal certainty for right holders, online advertisers and of course Google itself. The INTERFLORA case is based on a (seriously lengthy) reference containing 10 questions by the England and Whales High Court (EWHC) dated to May 2009. In the light of the ECJ’s Google France decisions in March 2009 the EWHC upon request by ECJ later reduced the number of questions in its reference down to 5 in mid-2010. AG Jääskinen published his opinion in early March 2011 and the final decision by the ECJ swiftly followed six month later. Bednarz, Keyword Advertising Before The French Supreme Court and Beyond – Calm At Least After Turbulent Times for Google and Its Advertising Clients, IIC 2011, 641. Bednarz in detail analyses recent French decisions in the light of the ECJ’s Google France decision and reaches the conclusion that, although the French courts were well-known for not missing a chance to find Google or its advertisers guilty on whatever legal matter (trademark law, law of unfair competition, tort law) was presented to them, this apparently has changed. Kulk, Search Engines Searching for Trouble? – Comparing Search Engine Operator Responsibility for Competitive Keyword Advertising Under EU and US Trademark Law, July 2011. Kulk (Delft University of Technology; University of Amsterdam – Institute for Information Law) reaches across the Atlantic and not only provides a splendid and short introduction into the topic, but also compares in detail the principles which the courts on both sides of the atlantic are following. While jurists from the US show little sympathy for the almost Prussian fixation of the ECJ on the requirements of trademark use, jurists from the Old World shake their heads in disbelief over the only legal concept that appears to be even more vague than the ECJ’s concept of the trademark function: the initial interest confusion. Bozbel, Benutzung der Marke als Domain-Name, Metatag and Keyword im Türkischen Recht, MarkenR 2011, 145. While the US and European legal systems mainly left it to their courts to deal with the topic of keyword advertising, Turkey has opted for the Utha appraoch, explicitly forbidding the booking of a third party trademark as a keyword (149). Bozbel in his article however does not only cover the topic of keyword advertising, but provides a short and concise introduction into Turkish trademark law and its views regarding, domain names, Meta Tags (*sigh*) and keyword advertising. For further articles published in which the author had a chance to participate or which he wrote – mainly 😉 – on his own, please check the publications tab.